The Egyptian fruit bat is one of the few megabats that roost in caves – roosting in the twilight area of caves, tombs and temples and sometime in rock crevices, garden trees, and date plantations. They can be found roosting in groups as small as 2 or 3 bats to as many as 2,000. Both male and female bats roost together in a colony. The bats crowd close together, always making body contact, especially with their young ones. These bats usually have only one baby each year, however twins are not uncommon. Mother bats carry their young at first, and then leave them at the roosts while they hunt for fruit. Babies are about 3 months old before they learn to fly on their own. Young ones stay in the same colony as their mothers and fathers for most, if not all, of their lives. 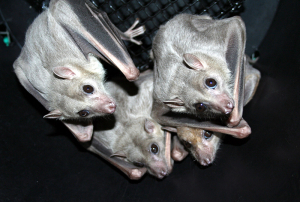 For more information on these lovely family-oriented chiroptera, visit the Egyptian Fruit Bat page at lubee.org.